"Wow! Just WOW! You will not find a better bobcat service and a more professional, congenial and hard working young man than Clayton. He has done two jobs for me over the past few weeks and he was more than capable of getting the job done and in a timely manner no matter what I threw at him and it was plenty, two trenches, plenty of soil grating and countless numbers of foundation / concrete pier holes anywhere from 10" - 24" wide and up to several feet deep." - J.T. "Wow!!!!! Impressive work Clayton. Let me start by saying that this guy is very polite and carries himself as a professional. From the time I contacted him he was upfront about his availability, potential risks that may prevent a successful project, and his pricing. 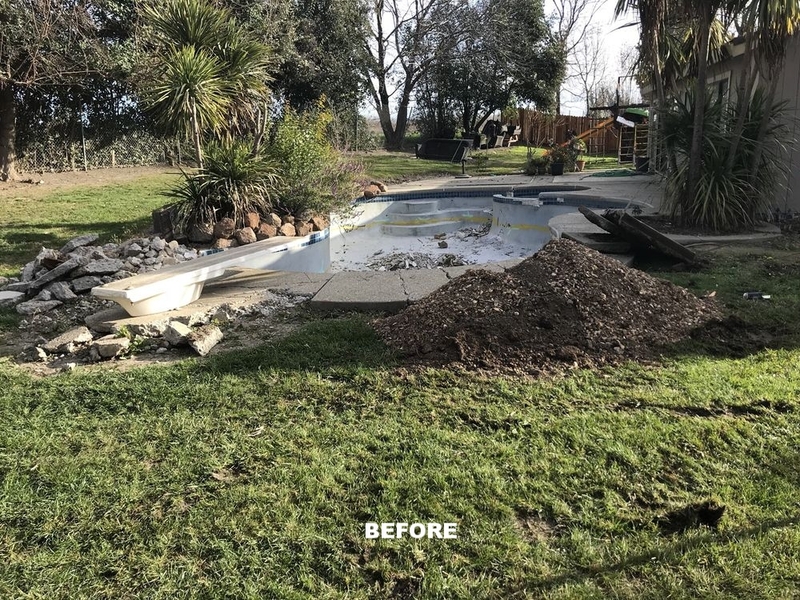 The project I tasked him for was a pool removal and leveling my backyard which he successfully accomplished. If you are searching for a company to demo your yard, pool, whatever it is don't think twice to call Clayton. Clayton is very methodical about every move he makes and let's you know as well. My project took 3 days to complete because of its size and every day he was there on that Bobcat... I cannot say enough about this guy but I will say this- YOU WILL not find someone else more involved in your project then Clayton. Your the man dude, thanks for your service and I will call you again." - E.L.
"My husband & I hired Clayton to remove approx. 20 cubic yards of soil & 10 tree stumps & some misc. junk. Our backyard has NEVER looked so good! He was on time. He cleaned up after himself. Even went the extra distance to fill in a dip in our yard. Let me know when he had to leave to go to the dump, so that I wouldn't worried he'd left for good. Very polite & friendly! 100% professional. It's obvious he WANTS your business. And his prices are VERY reasonable! We would definitely hire him again! And will recommend him to everyone!" -D.J. "I was so impressed by the professionalism and high standards of Clayton's Bobcat Services! He is great. Trench a for a French drain 140 long. The work was done over three hot, hard and dusty day. It was all outstanding work. The cost and time estimate was right on and was reasonable. I would ask him to return and work again without hesitation and would highly recommend him to others that are in need of Bobcat services." - J.J.
"The whole experience was great from start to finish. Clayton returned my original call within an hour, he was very friendly and accommodating. We had a pool put in and the company we hired left very large rocks and piles of dirt from the excavation. It was very daunting trying to figure out how to restore some form to our yard. We had an area that needed to be retained. Clayton gave us a very reasonable bid and showed up on time. He was very pleasant, and hard working. He change what could have been a headache, into a pleasant experience. The area is now flatten and retained with a beautiful rock wall. He finished early so he did a few other things for us as well. I would highly recommend him to anyone. We were very pleased!" - S.P. "I hired Clayton to remove about 15 yards of soil from my back and side yards and he did a great job. Clayton was responsive to phone calls, showed up when he says he will and conducted himself professionally . I would highly recommend him to anyone who needs excellent bobcat services for a great price." -M.P. "Not be be over zealous, but Clayton's Bobcat Services is Awesome! We have now hired Clayton for 5 full days for 5 separate projects. Clayton is not just a bobcat operator, Clayton is an artisan --- it is amazing to witness Clayton manipulate his bobcat forks to remove stubborn stumps, entire trees, and even roll a boulder into our goat pen! Clayton has successfully cleared and leveled an area for our goat pen, moved rocks and boulders to new locations, demolished and hauled away chicken coops and lama stalls, drilled post-holes for goat pens, created burn-piles, unearthed and hauled away stumps (one stump was 28 inches in diameter! ), and even removed a 20-foot koi pond for us! Clayton has used his front-loader bucket, his forks, his trencher, and his auger-drill for us --- we look forward to the day we need Clayton's back-hoe to dig us a drainage ditch and clean out our pond! Clayton works a full day from 9:00AM to 5:00PM without stopping for lunch --- Clayton has been a pleasure to work with on each of the 5 days we have hired him --- Clayton's rates are very reasonable, and, so far, Clayton has been able to tackle every project with which we have challenged him! We give Clayton and Clayton's Bobcat Services the Yelp 5-star rating of "Woohoo! As good as it gets!"." - S.S.
"Clayton's very professional and knowledgable. He removed a huge stump and root system, leveled the area, and hauled off the massive stump for a very reasonable price. It's amazing what a bobcat can do with the right bobcat attachment and operator. Don't get over charged by someone else! I was thoroughly impressed with the job he did!" - J.W. "Clayton is an honest and reliable contractor. He shows up when he says he will and is easy to work with. He is very skilled with his bobcat. I have hired him on multiple occasions and he has done a great job each time. Highly recommend!" -T.S.